Well a few things have happened recently that will only enhance your pleasure here at the P&S. One I got some storage space and two I finally got my stereo/vinyl equipment set up (remember that moving into our new house thing, well it's been all ipod/itunes since then, and I have finally had time to set my system up) So, what does that mean you ask, well as you can see by the title of this post, I hope to continue a series of vinyl only tracks not available on cd and write a few nice words about the album and post the tracks for your sampling pleasure. I have a whole bunch lined up and I will try to post a new VU every week or so. 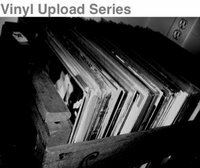 The only bad thing is that I will have to eventually take down these links to provide more, so these tracks will only be available for a limited time. I will try to let everyone know before I remove something though. So I hope this will only enhance your experience at the P&S. Oh, and for those Space Oddity guys, stay tuned. 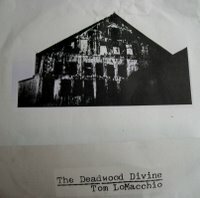 The very first VU is the The Deadwood Divine double 7-inch released through Bloodlink Records. This has to be one of my favorite "albums". Tom LoMacchio at his best! So much emotion tearing at his soul. Amazing! 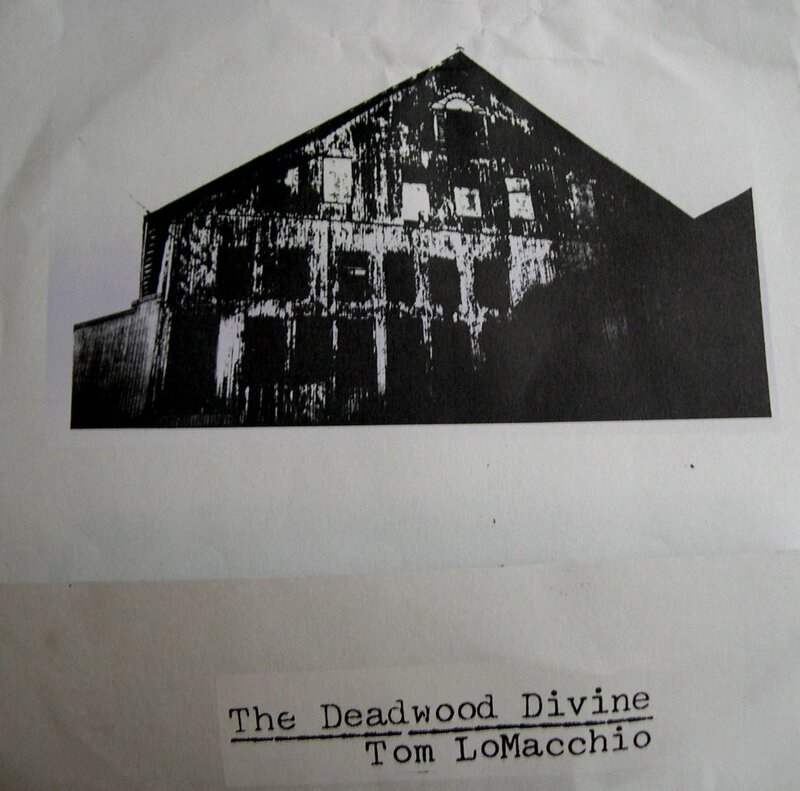 From 95/96 during the heart of the "emo" era, The Deadwood Divine perfectly combined elegant guitar work with the pain struck vocals of LoMacchio. 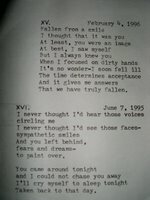 I am also providing a shot of the lyrics to XV and XVI that were on the inside cover of the fold-out. These songs have some of the most intense acoustic work I've ever heard and combined with Tom's words and vocals, he takes it to that place were few artist venture. LoMacchio has continued in music with the release of Five Years Later, which focused on a much softer side, the calm after the storm if you will. That's a great album as well so if you haven't heard it, check it out. LoMacchio is now performing under the moniker of Stereographonline and has almost totally abandoned the guitar and troubadour vocals for synth beats and Cure like songs. This 7 inch is one of my coveted pieces of vinyl and I hope you enjoy the track sampling below. 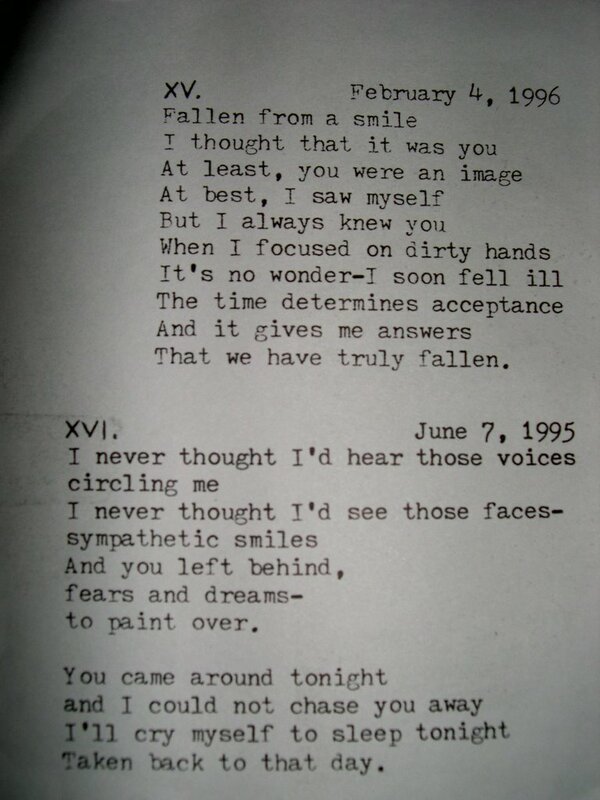 XVIII. to set us free.